Any Hackers interested in Hacking Punch-Out? Sent from the future to research Atari technology. To start, and reference, a particular Strong Bad E-Mail: E-Mail #117 "Montage"
Once the e-mail has finished, click "Strong Bad" for some extra content. This extra content is one of those rare, extremely crackheaded ideas that simply cries out for realization, that being a Punch-Out hack in which you play as a stack of pancakes. Think of it... Punch-Cakes! Or uh.. Pancake-Out! Stacks of Fury? Something. A savvy hacker with some time on his hands might not only be able to replace the Little Mac sprite sets with fighting pancakes and the trainer into a Strong Bad, but perhaps even change some opponent sprite sets to other characters. Imagine a Strong Mad instead of Soda Popinski, a King of Town instead of King Hippo, a Coach Z instead of Great Tiger (that's his name, right? ), Pom Pom instead of Bald Bull, and at the end... Bubs! So if any of you are looking for a project, give that one some thought. It'd be ... beautiful, in some way. Or just a colossally awesome hack and/or waste of time. Since a simple sprite hack will only get you strange colouration. Actually, NES pallette changes can be done just by a search/replace of the hex code, since each pallette is grouped in four colors. I actually had the same thought for a minute there too, until I realized that the Little Mac sprite is too skinny and there's no possible way to attach a pair of boxing gloves to a wagon of pancakes. Is this a 2600 game? If so what is it called I would like to try it as I was under the impression all the boxing games for the 2600 had horrible graphics, This one looks ok to me. How does it play? 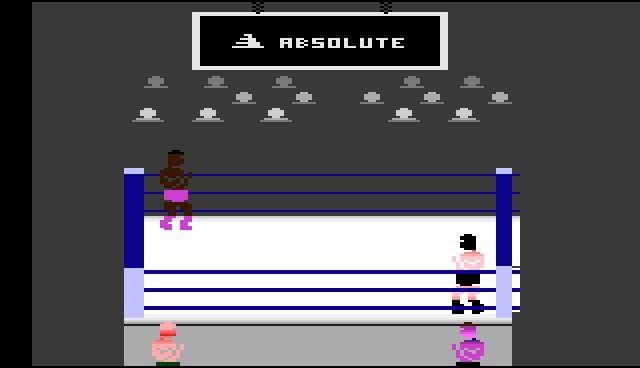 That is Absolute Title Match Pro Wrestling which was cloned from RS Boxing which is a great game! really really great. Makes Activision boxing look like two horny crabs on a platter. Edited by StanJr, Wed Jan 11, 2006 1:26 AM.